OTTAWA — The condition of Lake Erie and algae blooms on the body of water was addressed during a program Tuesday. 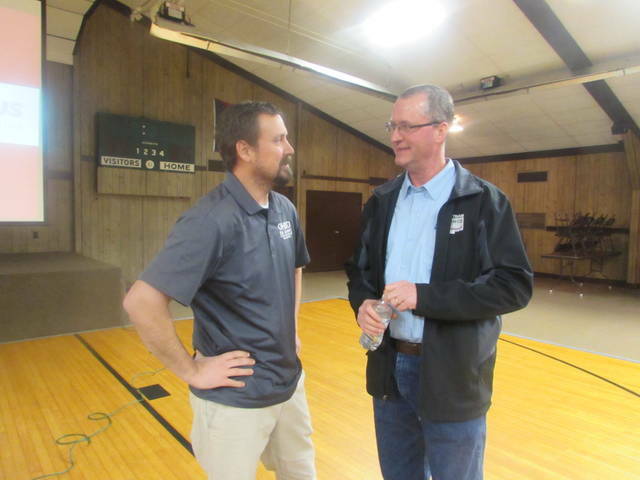 A water quality meeting held at Putnam County Knight of Columbus was organized by Ohio State University Extension Putnam County and Putnam County Soil and Water Conservation. It was attended by 200 farmers and Soil and Water members. Dr. Chris Winslow, Ohio State University Sea Grant College Program director, was the featured speaker. He said OSU was provided with funding to conduct research on Lake Erie algae and dredging issues. “We know the algae in Lake Erie is driven by excess nutrients such as phosphorus and nitrogen and we are trying to hone in where the nutrients are coming from,” Winslow said. The risk with the algae blooms is that they can produce toxins that can cause harm to humans. “In 2015, there was en entire stretch from Pittsburgh to Cincinnati with a continuous algae bloom,” Winslow said. He said the research that is being conducted at OSU can be used to help solve the problem in Ohio and throughout the country. The university is studying ways to produce safe drinking water by doing research on how to remove toxins from water, studying risks that algae toxins present to human health and working on researching how blooms behave such as reproducing and location in the lake. He addressed the topic of nutrient sources and said the Maumee and Sandusky rivers are the largest phosphorous loaders and agriculture is the dominant land use in these watersheds. He added that rainy years have higher nutrient inputs with 70 to 90 percent of phosphorous loads that occurred from 2002 to 2013. Winslow provided tips to prevent phosphorus from entering water systems. Tips included avoiding fall and winter application of fertilizer and manure, not laying fertilizer when the rain in in the forecast or when there are saturated soils and adopting subsurface placement of fertilizer. “We need to reduce the load of phosphorus by 40 percent to reduce algae blooms, but that will not help overnight,” Winslow said. He said property owners can reduce phosphorous by getting rid of fertilizer that it is in and by controlling water on property runoff. Jeff Duling, Putnam County Soil and Water Conservation District chair, who also is a Putnam County farmer, said he wants to make sure phosphorous does not get into bodies of water. “Water quality is on my mind all day in my line of work, and we are looking for ways to make the ground better,” Duling said. Reach Jennifer Peryam at 567-242-0362.